Before Darren Aronofksy floods the world for 40 days in his movie Noah, he'll do it in comics, too. The Noah graphic novel, comes out this on March 18th, and if the movie is anything like the comic, it's bizarre, epic and Biblically accurate. Aronofksy and co-author Ari Handel stopped by to discuss their vision. io9: What's your fascination with the Noah story? Darren Aronosky and Ari Handel: Destruction by water — everything we know being washed away, but also everything being cleansed — we think that's universally fascinating. There's a reason why so many religions and cultures have flood narratives. It's a fundamental story. It seems like Noah is an otherworldly fantasy; it almost looks like it was set after the post-apocalypse. Is that true? Actually the story takes place BEFORE history. If you look at Genesis you see that the antediluvian world was very different from the world after the flood. Human beings had life spans of many hundreds of years, fallen angels walked the earth and leviathan swam the seas. The rainbow Noah sees is the first rainbow of all time, so even the skies and atmosphere were somehow different before the deluge. If you're actually being accurate, the Noah story doesn't take place in a Middle-Eastern desert, it takes place in this unique world. We wanted readers to feel that uniqueness and that strangeness. You made the comic while you were waiting to get financial backing for the film, but what made you decide to visualize it as a comic at all? We had a great experience having Kent Williams make a graphic novel out of The Fountain, so when we weren't sure when we'd be able to get Noah made as a film we teamed up with Niko Henrichon to do the same thing with an early draft of our Noah script. We wanted to get the ideas out there. In both the comic and movie, the design of the Ark is really unexpected. What inspired this look? The design comes straight out of Genesis, which describes the Ark in great detail. And what it describes is a giant rectangular box. The expectation many people have in their heads, of a houseboat with a rounded keel and a sailor's quarters on top, the ship we see in cartoons and kid's toys, that isn't grounded in Genesis at all. And it makes sense Noah had a box not a boat. He didn't need to steer his Ark because there was nowhere to go. All he could do was float. The angels are even more bizarre. What inspired their design? There is a famous, mysterious line at the beginning of the Noah story which says that "Nephilim walked the earth in those days…" Nephilim means Fallen Ones and a lot of time and thought over the centuries has gone into thinking about what they were and what this line was all about. A common interpretation is that the Nephilim were fallen angels. But there's really no descriptions of what they looked like. So Niko used his imagination. The only real constraint we used is that in the bible certain other angels are described as having six wings, so we took that as a starting point. The graphic novel is beautiful, thanks to Niko Henrichon's art. How much has the comic informed the design of the film? For the most part the design of the film and the graphic novel developed in isolation from each other. Niko really had a lot of freedom to draw the story as he saw it. In one or two instances, like the Ark itself, we gave Niko some design ideas we were developing with for the film, but mostly they are two separate works. Story-wise, how closely will the finished movie resemble the graphic novel? Are there any significant changes? 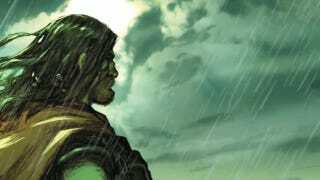 The graphic novel is based on a first draft of the Noah script. While Niko was working and drawing based on that early draft, we kept on writing and refining for a few years before we started filming, so the two stories diverged quite a bit. Of course they both track along with the story in Genesis so they have a lot in common — and the themes and characters have remained very much in line. But scene to scene there are a lot of differences. Is there anything in the comic you were unable to bring to the screen? Obviously, film and comics are different media. For film there are some things, especially with vast landscapes and intricate sets, that are hard to do photographically or even with visual effects. But Niko does everything with his pen, so he was only limited by his imagination. Probably the biggest thing that's in the comic that isn't in the film is being able to go inside a city full of the wickedness of men. Reading the graphic novel, it's clear your Noah is a religious story, but not necessarily a Judeo-Christian story. Are your prepared for the complete freak-out some people will have about telling a Bible story in this manner? Well we started from Genesis and the millennia of religious commentary surrounding it. That's how we grounded our story and that was the well-spring for the themes we were trying to dramatize, so it is a Judeo-Christian story in that sense. But you don't need to be Jewish or Christian or even religious to be familiar with the Noah story or be moved by the idea of a universal flood punishing mankind for our wickedness and threatening to wipe us out for good. That's part of our cultural heritage. It's buried deep. And like all deeply ingrained stories it continually gets retold and reinvented with each telling. Hopefully our telling resonates with all sorts of people, Jewish or Christian, atheists or believers.